Elia started singing as a young girl in Israel, eventually serving her country as a representative singer during her army service. After serving, she began singing more and more in local bands around the country. Elia soon had grown very connected to the Israeli music scene, having worked with many of the country’s top musicians, and was able to begin work on her debut album in Hebrew. The album was nationally acclaimed, seeing (and continuing to see) much airtime on Israeli radio. 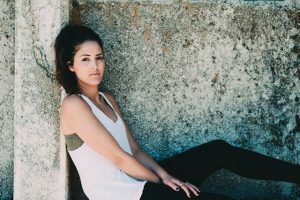 With a diverse style, ranging from top 40’s pop to soulful R & B, Elia has so much to offer the American pop music world. She brings grit and passion to a genre which is often expected to be clean and monotonous. Elia is a strong and unwavering force of music and feminism, putting her boundless passion into her songs and her sharp mind into her collaborations. For me, 2016 was an excellent year, in which I finished producing my second album in English…. It is something I’ve always wanted to do, to get out of the Israeli mainstream. It’s an impressive achievement for me. 2017 started out great! I released the first single in the album and I got a lot of love and I’m so happy about that! Yes. I always wanted to be a singer and write myself songs. Except for being a singer songwriter, I’m also an education student in me last year of study and this is something I always saw myself integrated in… Maybe without the music it might have taken 100% of my energy. I would love to know more about your experience as a representative singer during your army service? What did you learn from doing that? It was an enjoyable experience for me. However, it was less interesting than the main role I had in the army- education commander…A role which provided many challenges and special connections created with amazing people. I’m really grateful for it. You are considered to be Israel’s “next Adele.” What does that comparison mean to you? Do you feel any pressure when you continue to hear it? Wow! It’s clearly an amazing comparison and a compliment. Nevertheless I’m not the kind of a person who likes to compare himself and my music to others but I allow myself to accept this compliment. I think that Adele is really an outstanding singer! How creatively involved were you with the making of your latest video for your single “Damn”? Where did the inspiration for the song itself come from? To tell you the truth, it was very embarrassing, since it was the first time I was involved with a video. I thought it would be weird, but somehow it became natural. In addition, the photographer is a good friend who managed to turn it to an enjoyable experience. I had this moment where I felt fear of leaving someone you love. I think that the outcome of this song might be pressuring, getting to extreme dimensions, but I cannot say that there was not any connection and accommodation while writing. When do you hope to release more new music and a full EP or even album of new songs? I’m writing and composing all the time! I hope to produce another album at the beginning of 2018. I am curious to know what the music scene is like in Israel. What has it been like breaking through there? What would it mean to gain the same exposure here in the U.S? In Israel, I get a lot of love, at the same time it’s hard to progress with my genre. Therefore, I decided to aim into a different place and to write in English. Regardless, the connection is more closely when it comes to creating in English. Success in my area will be considered high achievement and very impressive. I’m very happy for the opportunity to bring myself to an international audience, not to mention the possibility to the chance for big exposure out of Israel. I’m inspired by many musicians…among them are Keane. I’m usually inspired from musicians you can really feel their soul and spirit when they sing. This means everything to me and I would really really like to work with Steven Tyler from Aerosmith and with Keane too. I don’t think that I’m focusing on passing along a specific message, because sometimes I write things I feel less comfortable with personally. I believe that the best advice I can give is to ignore the surroundings and those who are interested to turn you into what you are not. Know yourself better and create according to what you see and want. This is where it all starts.